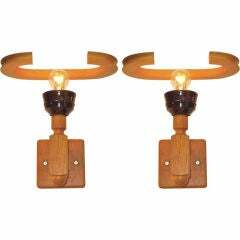 "Arceau" Wall Light Guillerme & Chambron, "Votre Maison"
Handsome pair of French wall sconces in cerused oak by Guillerme et Chambron. 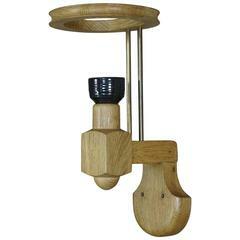 Beautiful wood with new silk shade which rests on a turquoise ceramic socket. Very unique design. Newly rewired. 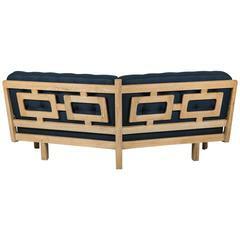 Pair of Guillerme et Chambron wall sconces in oak. Votre Maison Edition Shades missing. Pair of Guillerme et Chambron wall sconces. Pair of French wall sconces in light oak with ceramic caps by Guillerme et Chambron for Votre Maison. Stamped on reverse. 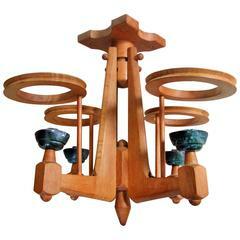 1960s French design oak and ceramics chandelier by Guillerme and Chambron.